On the 96th anniversary of the opening day of the infamous Somme offensive it seems fitting to write a Somme-related post. 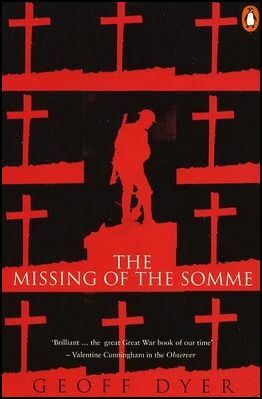 I recently picked up a copy of Geoff Dyer’s The Missing of the Somme in a charity shop. It is very rare that I finish a book about the First World War and want to read it again immediately, but in this case I did. It is quite different to the usual books about the campaigns, battles, or individuals of the war, but this is part of its appeal. It is difficult to characterise the book; it isn’t even strictly about the Somme per se. In Dyer’s own words it is “not a novel but an essay in meditation: research notes for a Great War novel I had no intention of writing, the themes of a novel without its substance.” Part discourse on remembrance and memorials, and part literary review, the latter portion of the book also dips into Dyer’s visits to the battlefields, cemeteries, and memorials of France and Belgium. A multitude of topics and themes are covered, from the form of memorials and sculptures, to the landscape of the war and the extent of the destruction, and the meaning of remembrance. Even film footage of the war is touched on, with the inevitability of the outcome of many of the troops filmed effectively marching to their deaths weighing heavily on Dyer’s mind; Binyon’s intonation “We will remember them” (written in September 1914) a prophecy of the losses to come. Dyer looks at the war through symbolism, expression, and emotion. A critique of the war poets and literature inspired by the war form a large part of the book. Dyer asserts that in trying to express what the experience was like most authors and poets resort to such clichés as to in fact render them meaningless, the experience being impossible to convey to those who were not part of it. At times we are reminded that Dyer is an essayist rather than a historian of the war – dismissing out of hand that a game of football was played by the opposing sides on Christmas day 1914; asserting that bayonets were rarely used as weapons; or his unquestioning acceptance of the ‘cover up’ of Haig’s conduct of the war propagated by Denis Winter in ‘Haig: A reassessment’ (“Winter’s obsessive scrutiny of the Haig records and their incriminating gaps has destroyed the last shreds of Haig’s reputation”). In these areas the lack of primary evidence-based research lets him down, although this is a minor gripe and does not detract from the book overall. The Missing of the Somme is a rambling meditation to remembrance but manages to articulate many of the thoughts and feelings that may usually only lurk at the back of the mind of any historian of the war. Dyer himself seems to be grappling with comprehending the incomprehensible – the loss of lives of such a huge scale – and at times it can be difficult to follow his thought process. However the book raises interesting and still pertinent questions about remembrance and for that at least it must be commended.